In a heavy Dutch oven or large pot, combine the beans, salt and salt pork with enough water to cover. Over medium-high heat, bring beans to a boil and cover. Reduce heat to low and cook for 1 hour. 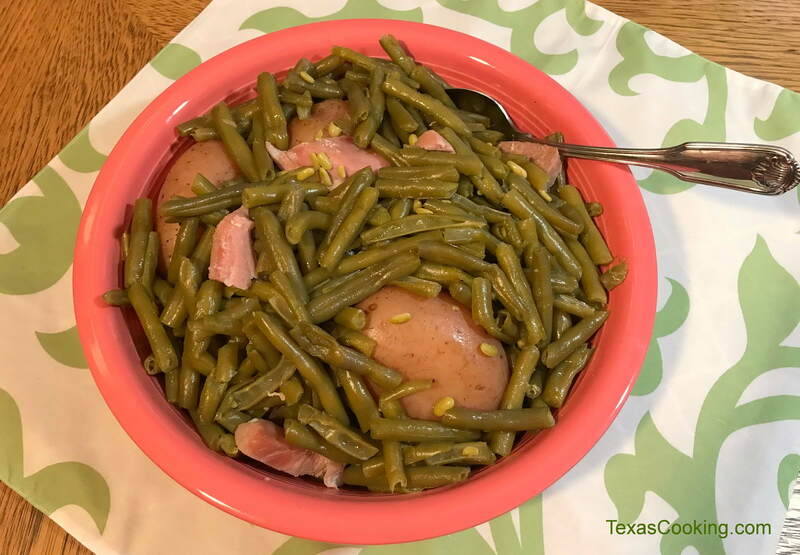 Note: This recipe is an excellent illustration of how Texans earned a reputation for cooking vegetables until they begged for mercy. Granted, green beans, like most vegetables, retain more nutritients when they are cooked less. However, they sure are good when cooked the old-fashioned way. To prepare a pot of fresh green beans with nutrition in mind, half fill a Dutch oven or large pot with water and bring it to a boil. Then add about 2 pounds of snapped green beans to the boiling water. After the water returns to a full boil, boil for 8 minutes; remove pot from heat and drain beans. Rinse beans with cold water to stop the cooking process. When you are ready to eat, reheat the beans with 3 or 4 tablespoons of butter and season to taste with salt and pepper. Of course, if you refuse to have butter on your plate, you can substitute a little flavored olive oil.